All My Other Crochet Patterns! I'm continuing my spring clean of the site, yippee! Most patterns have now got their own themed section on the left in the navigation bar. But my Solomon's Scarf has nowhere to go at the moment, so he's staying here! 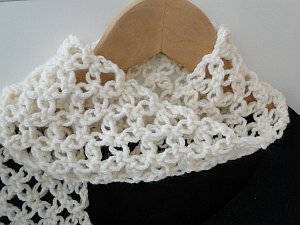 Worked in a soft Aran weight yarn, this scarf grows fast! My pattern includes lots of photos to show you exactly how to make this very stylish piece.